If you teach only five comprehension strategies this year, make them CONNECTING, QUESTIONING, INFERRING, CLARIFYING, and SYNTHESIZING. 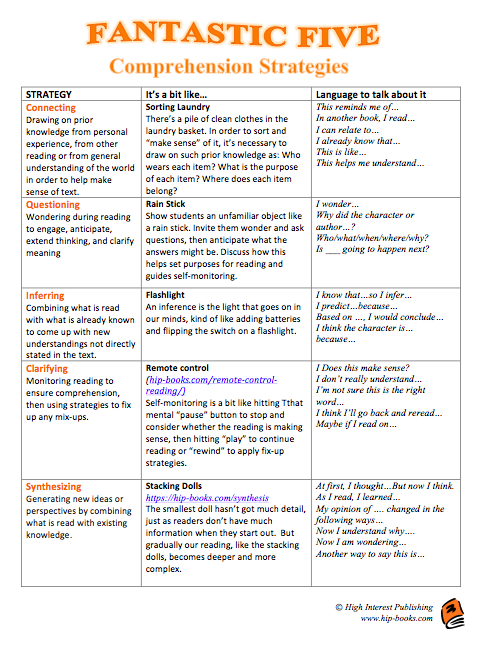 Click on the image on the left to download a chart describing each of the five strategies, along with an analogy for each and some words to use when talking about the strategy. Teaching metaphors for strategies helps students understand abstract ideas by linking them to familiar objects or actions. Teaching the language of the strategy helps learners think about their thinking (metacognition). Of course, no single reading strategy will work everywhere, all the time. To be effective, strategy instruction should address multiple strategies and how to coordinate them. When reading is easy, it just clicks along, with no need to apply strategies. But when the reading is difficult, readers need to be able to draw on a repertoire of strategic actions to help them make sense of those tough texts.